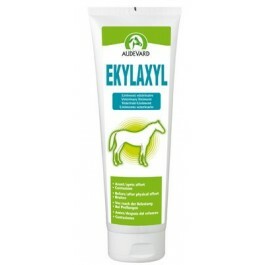 Ekylaxyl is an arnica-based gel formulated by AUDEVARD Laboratories. It is designed for local application to relax muscular areas before or after exercise. Arnica-based liniments are essential products for all horse owners. They are great for treating muscle stiffness before and after exercise and a good solution in the event of knocks and bruises. The Ekylaxyl formula combines the properties of arnica and yarrow with a hyper-oxygenated oil base for more effective use of the ingredients. It does not contain any ingredients with a doping effect. Its texture is designed to ensure it can be massaged in effectively, while leaving the hands clean and dry after application. An ideal formula for massages and bruising, Ekylaxyl is a must-have in all grooming kits! Does not contain any ingredients that could lead to a positive result during anti-doping tests, and can therefore be used safely in all circumstances. Composition:Water, paraffin (liquid oil), hyper-oxygenated glycerol triesters, yarrow (Achillea millefollium—ext. ), camphor weed (Arnica mexicana—Ext.). Arnica-based Gel made from plant extracts and hyper-oxygenated oils for massaging the muscles, ligaments and tendons of horses before and after exercise. Hygiene product for horses. Instructions for use: external use only. Put a sufficient amount of product in the hand and massage the area to relax. Ekylaxyl can be used once to twice per day in preparation for an event or during recovery. The Ekylaxyl formula does not contain doping ingredients.